ON AUGUST 15, when Prime Minister Narendra Modi announced extending the financial inclusion plan of the former UPA government and renamed it Pradhan Mantri Jan Dhan Yojana (PMJDY), he was well aware of its limitations. Though launched in 2010, the plan had miserably failed in achieving its target of bringing all unbanked households in rural and urban pockets into the formal banking system. Modi therefore, not only set strict deadlines, he offered freebies to encourage people to open bank accounts. He promised to top up each bank account under PMJDY with a life insurance cover of Rs 30,000, accident insurance worth Rs 1 lakh, and a debit card from domestic card network RuPay. He also promised to allow overdrawing bank accounts by up to Rs 5,000. And all this without a single penny paid as premium. The publicity worked. “Banks received more than 40 million applications for opening accounts within 20 days of relaunching the programme,” says G S Sandhu, secretary, Department of Financial Services. While banks, without adequate infrastructure, are struggling to open the millions of accounts, many say the freebies under PMJDY are nothing but a political gimmick. The urgency behind rolling out the programme is to kick-start the direct benefit transfer (DBT) scheme. Under DBT, the government plans to transfer pension money, LPG and kerosene subsidies and other social welfare benefits through the bank account of the beneficiary to plug welfare leakages, says C H Venkatachalam, general secretary, All India Bank Employee Associations. While the intention is good, some fear that the government may discontinue the facilities once the targeted number of bank accounts are opened, he adds. Venkatachalam’s fear is not without reason. Even two months after relaunching the plan, the government is yet to spell out how to implement PMJDY. It is silent on who will foot the insurance premium bill. While most people opened the accounts lured by the overdraft facility, few are aware of the riders attached to it. 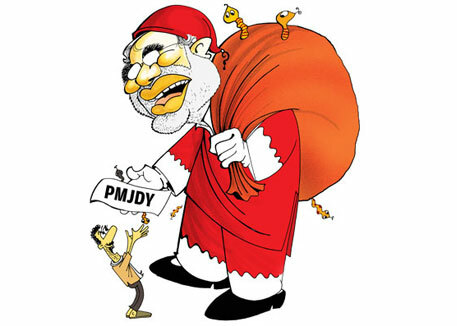 “The message of PMJDY is being spread in such a crafty way that most people assume that they would receive Rs 5,000 once they open bank accounts,” says K G Karmakar, former managing director of the National Bank for Agriculture and Rural Development (NABARD). But availing the facility is extremely unlikely. Banks extend overdraft facility to only those customers who have a “good relation” with the bank. Then there has to be a prior agreement between the banker and the account holder to withdraw beyond the available balance. The bank levies an interest on the extra amount withdrawn. There has been little awareness in this regard, explains Karmakar. Till March 2014, only 2 per cent of account holders (under the financial inclusion plan) availed the facility, according to the PMJDY notification issued on September 29. Banks are reluctant to allow overdraft because more often than not people default on the loan. To allay bankers’ fears, the government in its September 29 notification announced setting up a Rs 1,000 crorefund that would provide guarantee against defaulters in overdraft. But the fund is minuscule when compared to the scale of PMDJY. The government’s own estimates show that if the 130 million unbanked households in the country default on loan after overdrawing their accounts by Rs 5,000, the banks would incur losses to the tune of Rs 65,000 crore. M G Vaidyan, chief general manager of rural business, State Bank of India, says it is the bank’s discretion whether it wants to provide overdraft facility to someone. Though the government has assured insurance to PMJDY account holders, it has not specified who will pay the insurance premium. It has asked the National Payment Corporation of India (NPCI) to pay the accident insurance premium from the money it would earn through transactions of RuPay debit card at retail outlets. But NPCI is yet to give its nod. “There is no clarity on what percentage of the transaction charge would go as insurance premium. We are not sure whether we will have to bear the premium this year or every year,” says an NPCI official. There is another pitfall. Only those who have made at least one transaction within 45 days of opening the bank account would be eligible for free accidental health insurance. Not enough awareness has been created about this provision. The government has reportedly approached Life Insurance Corporation (LIC) of India for footing life insurance premium. “It is true that we were contacted but there is a lack of consensus in the board whether LIC should bear the responsibility. The letter does not clearly say for how long LIC will have to pay the premium,” says a board member. A back-of-the-envelope calculation by Yogesh Gupta, senior vice-president of Bajaj Allianz Life Insurance, shows that the annual premium for accidental insurance is nearly Rs 400 crore and Rs 700 crore for life insurance. “Banks will agree to part with such a huge sum only when there is a clear road map,” says Gupta. Customer highly unlikely to be able to avail this facility as it is the sole discretion of the bank as to whether it would allow it. Jan Dhan Yojana: Can 10 million bank accounts be opened in one day?